Pedlow Skatepark in Encino has a great, massive and roomy keyhole bowl, a large street course, a super tight, shallow snake run and some horseshoes in the street area. There is unfortunately no tree cover and subsequently no shade in the entire park so summer afternoons are brutal. It is near a school also so after 2PM, watch out for the flying groms. Shot for National Lampoon. 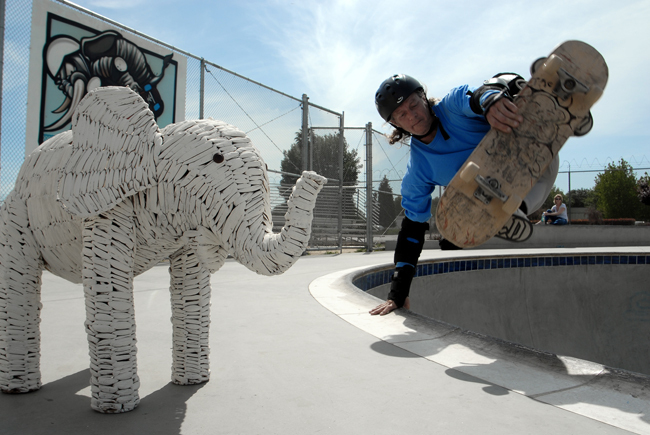 I do not remember the significance of the white wicker elephant but this guy had a nice layback air.